Alabama Bloggers: Jim N Nick's Creates Local Pork Sourcing. 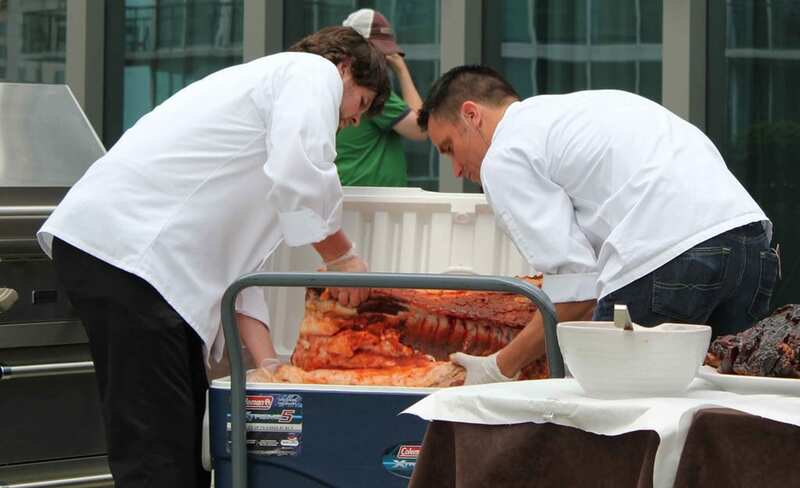 Jim N Nick's Creates Local Pork Sourcing. I was honored to be able to attend Jim N Nick’s learning session at the Atlanta Food and Wine Festival on Saturday. I know, I know – you go to things like that to learn about food you don’t eat all the time. But I was so proud of how Birmingham was representing at the Festival that I wanted to experience it. And I learned quite a lot. For instance – I learned that in 27 restaurants, they don’t have a single freezer. And I learned that Jim N Nick’s is committed to more than just serving the best Bar-B-Q in town – they’re committed to the process of revitalizing the local pork industry. While we watched Drew Robinson, the Executive Chef, butcher and grill a pork tenderloin, we learned about their Heritage Hog program, with the discussion moderated by Jennifer Cole of Southern Living. Sam Burns, whose official title is “Commissioner of Culture”, shared about their vision to bring the family hog farm back to the south. A while back, he and owner Nick Pihakis set off on a road trip through Mississippi in the attempt to find hog farms. And they found very little. Despite the fact that the South used to be plentiful in hog farms, they are no longer in existence. They realized that their dream was going to take a lot of time – and effort – to come to fruition. To revitalize the South’s pork industry, there would have to be more than just trustworthy farmers. 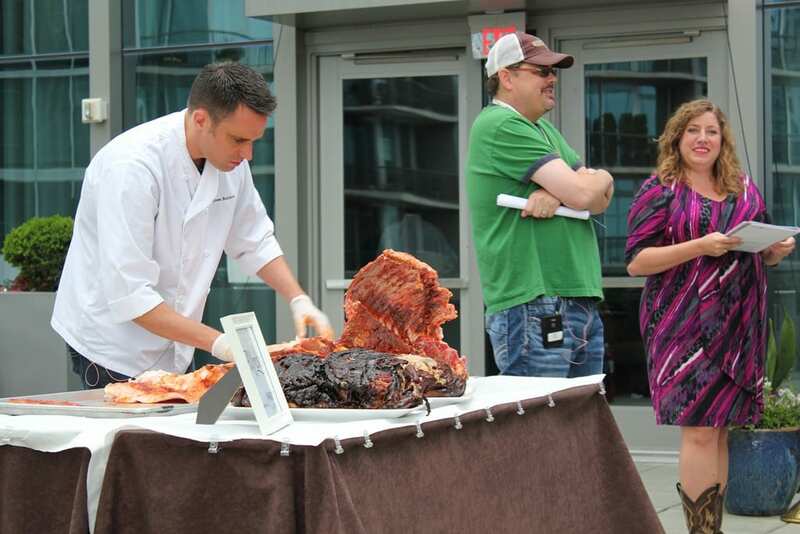 They needed suppliers, processing plants, distributors, and restaurant guests that could appreciate the value of locally sourced meat. So they formed a plan, and started taking steps to realize their dream. First, they set out to create an appreciation for the pig. They created the Fatback Collective, a group of chefs that were committed to the dream of local sourcing. This team also formed Jim N Nick’s team at Memphis in May, where they placed in the finals on their first year, an unheard-of achievement. Secondly, the formed Fatback Farms – a collaborative of local hog farmers that were doing it right. Finally, they bought a distribution plant in Eva, Alabama to give the farmers the infrastructure that they needed to do business. Currently, they have five farmers. To supply the four million pounds of pork that they serve a year, they need 40 – 45 farmers. Sam estimates that reaching this goal is a five year journey. 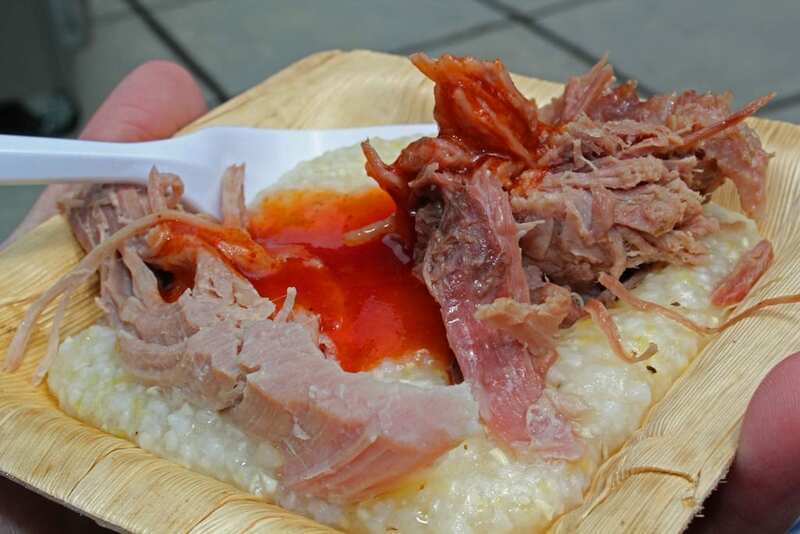 We were privileged enough to get to taste this magnificent pork served with their signature sauce and on a bed of locally made grits. It’s a dish that I won’t soon forget. Their locally sourced pork is currently available at their new Homewood restaurant, Little Donkey. 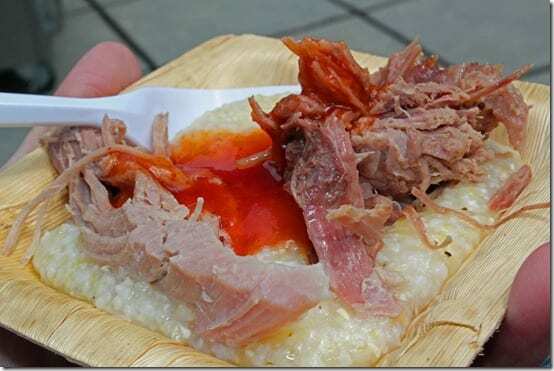 For further coverage of the Atlanta Food and Wine Festival, check back tomorrow at my other blog, Grasping for Objectivity. I loved Jim N Nick's before, but now I'm an even bigger fan! What a great idea. We need local hog farmers for several reasons in addition to those listed in this blog. It is good for Alabama's economy to develop more farming ventures here and it's good for the environment because meat doesn't have to be shipped from thousands of miles away. Three cheers for Jim N Nick"s!